Dear New Enough, We have enjoyed the great bargains on high quality merchandise from New Enough for the last 5 years. We were especially excited when the Parts & Accessories division opened, allowing us to score a great closeout deal on this tank bag. 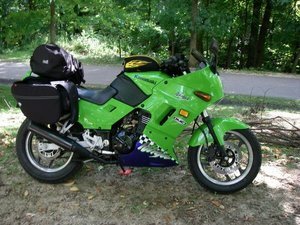 It worked great on Carol's Ninja, and with six kids and eight riders in our family, and another five rider relatives we look forward to New Enough's continued phenomenal bargains combined with unmatched levels of customer service. Jeff F.